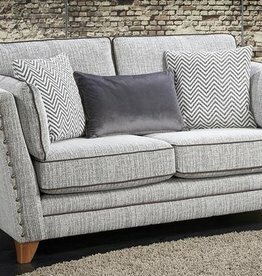 A contemporary design with a mixture of different fabrics coming together in glorious harmony. Sink into the soft deep seats surrounding yourself in comfort. The faux leather arms and surrounding flash are a fabulous design feature which is followed through to the angled dark wooden foot.